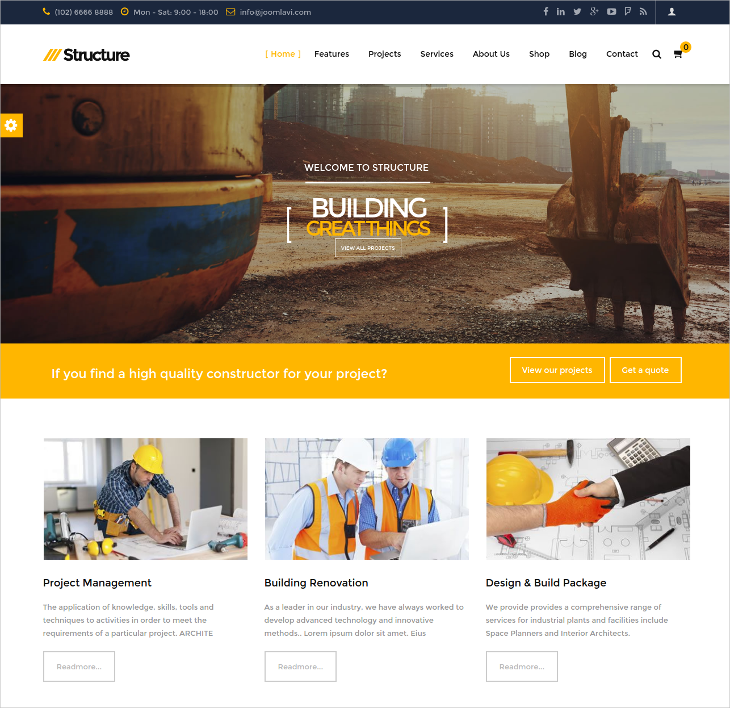 Construction company templates and designs are meant to bring the raw looks, and yet the structural simplicity in look that every construction company site needs in order to make an impression. Besides there are some other important functions, like the Google maps integration to show latest projects, slideshows to show best works, and engineering drawing and architectural diagrams. These WordPress and Joomla business themes & templates are for the best results. 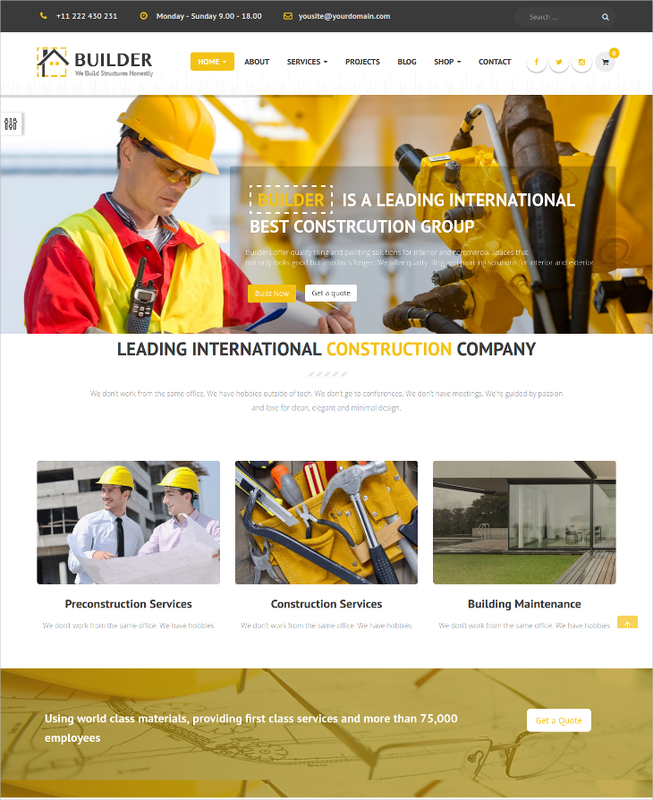 The business theme is well suited for a construction company website with the style of colors and the choice of images on sliders. 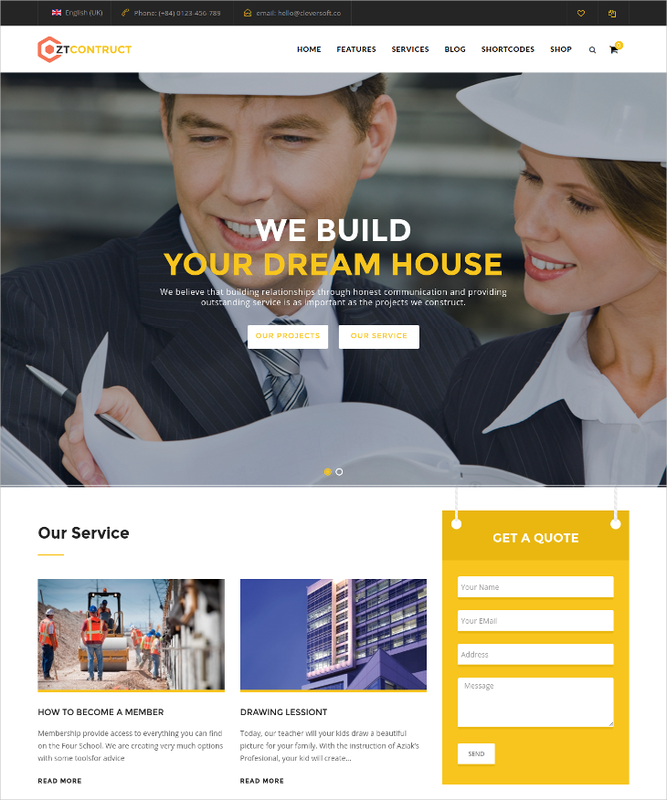 The theme features a drag-and-drop page builder which makes the making of a web page smooth, effortless and an enjoyable process. This is a responsive design with a nice blog and portfolio combination. This is another simple template that has been designed with a monochrome color scheme, thus making it simple, and able to draw attention to the image details and text. 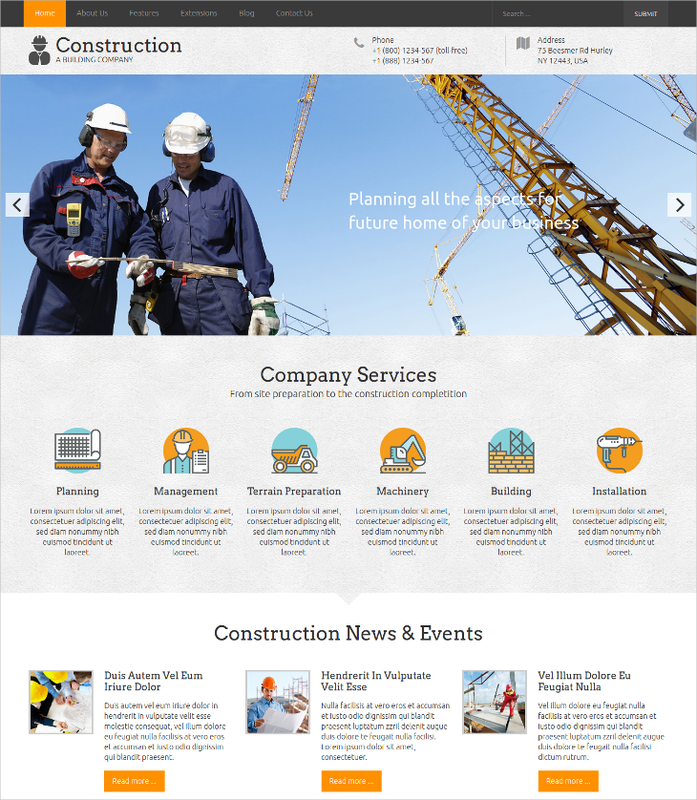 The theme is a lovely construction site friendly theme. The theme contains a comment box too. Here is another nice construction and engineering site friendly design, that is made to give you an excellent site structure and great looks. The professional template features, bootstrap support and T3framework support, both light and dark theme styles, a lovely revolution slider, and 5 different choices for the home page styles. This is a blog style engineering website design, where you let a lot of places to update blog posts, update textual matter, and can update about latest projects, their status, etc. Other features are parallax effect, the lazy load effect, a responsive design and lot more. 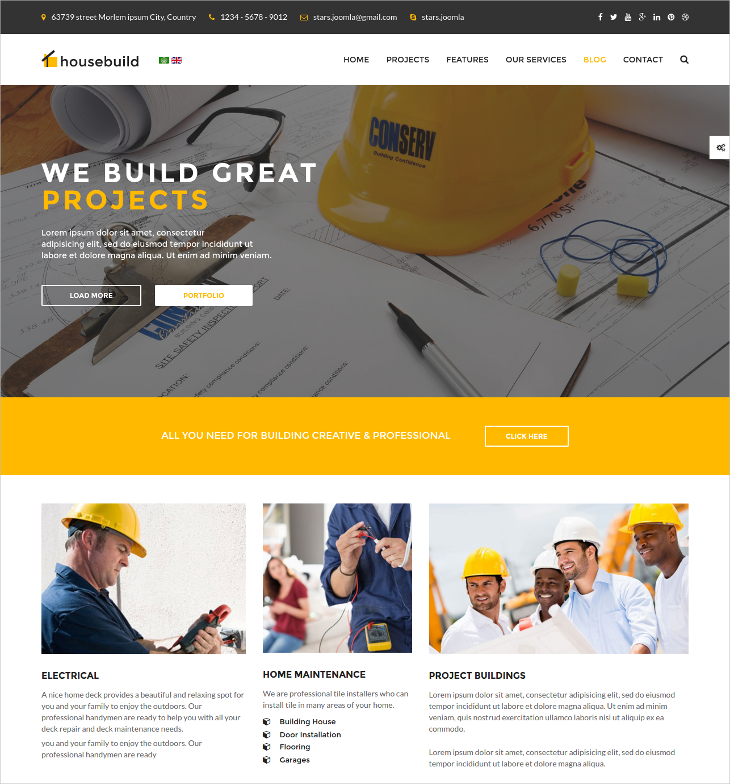 This construction site related design has the use of sober and bright colors for contrast, with a revolution slider, grid based text display, and easy operability, and the easy to install design features. Other advantages are the latest virtuemart and eight color schemes. You get 5 home page designs too. 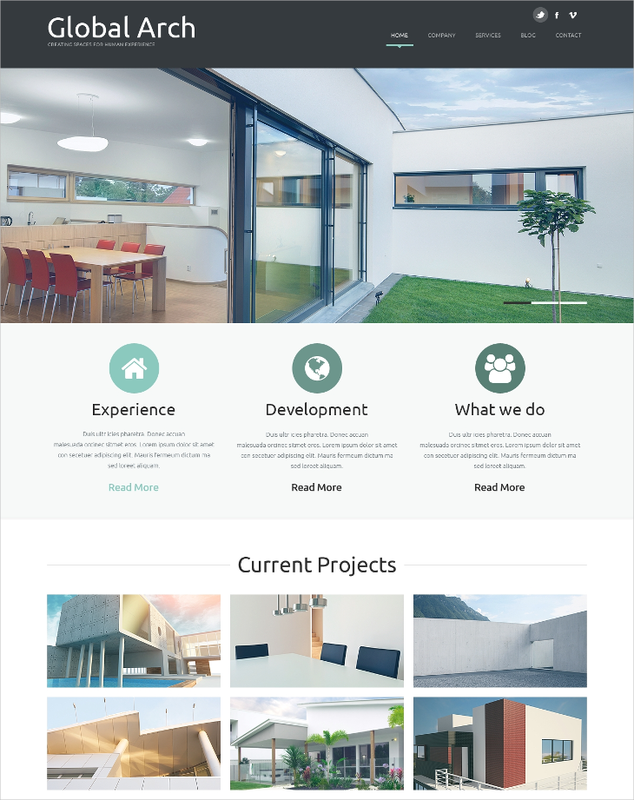 This is a purely architecture design company theme, where you get lovely features and looks. The home page contains a small header area and a text area that may contain text or icons. The rest is dedicated to the slider. Custom page types, animated portfolio with filters, the comments box, etc are other interesting features. 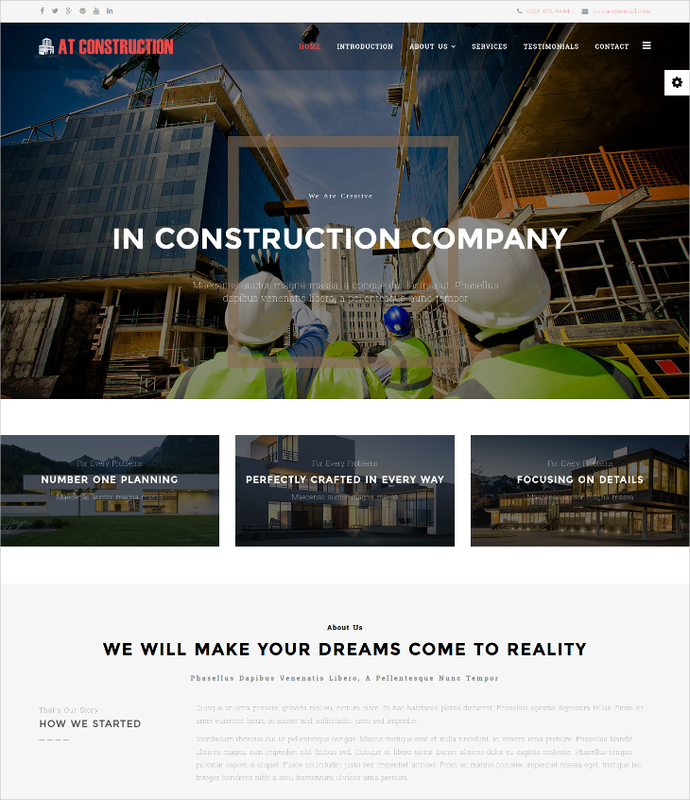 Another slider dedicated theme is here for the construction site and architects’ site. HTML5, Bootstrap and Joomla are the main site support. Besides, the template offers retina readiness, lots of shortcodes, a sticky megamenu, a Joomla bonus page, cross browser compatibility, etc. 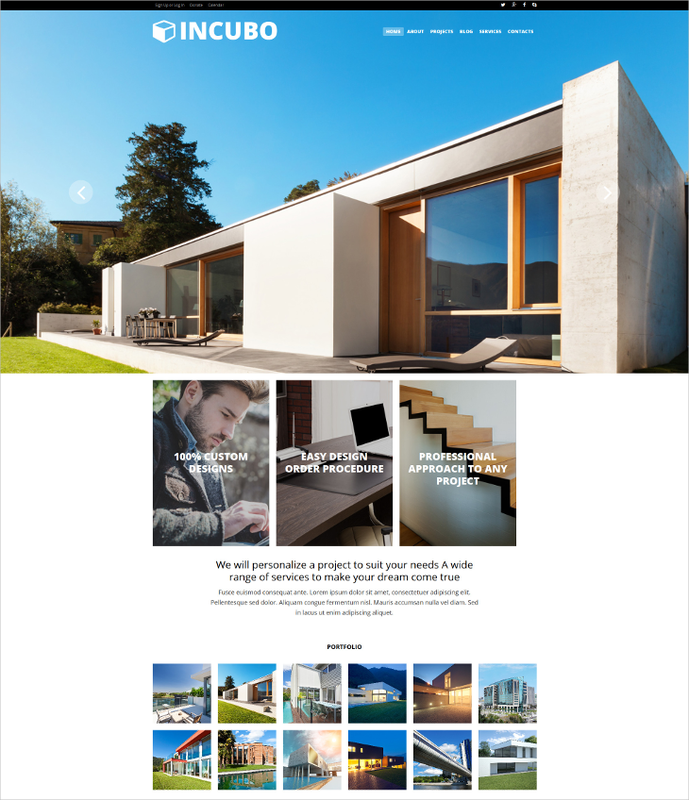 The full page slider is the main visitor attraction for the interior design, architecture, or engineering design related site. You may also use this for real estate. The retina ready design, lazy load effect, responsive layout, all works great in combination with cross browser support and great Joomla support. This is a grid based website design, with a giant slider, and the small image display boxes with little text info. The features are article post formats, mega menu, and off canvas menu, layout manager, a custom CSS code, retina ready logo and images, social comments box, etc. 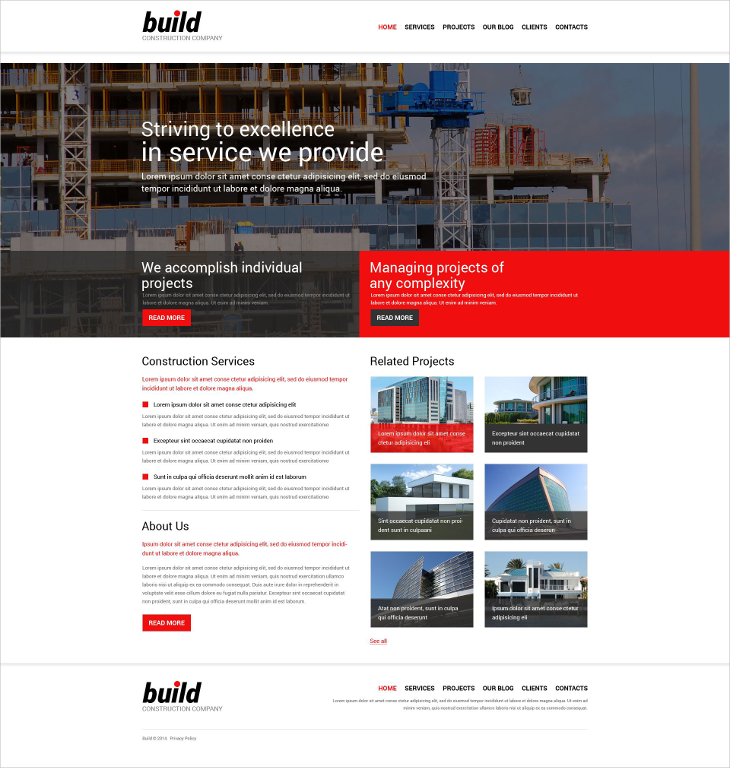 This is a construction website based design, which you may use to enjoy great sliders, a language switcher, ZT one page checkout, shortcodes, Ajax powered comments, contact form, shopping cart and much more. It also has a contact pro extension and the support of Zo2 and bootstrap framework. The page here shows a wonderful responsive design, which is a minimalist fast loading design. It comes with the megamenu feature, Bootstrap support, sticky header, article post formats, advanced typography, custom CSS codes, an advanced layout management system, and an overall strong and stable framework. 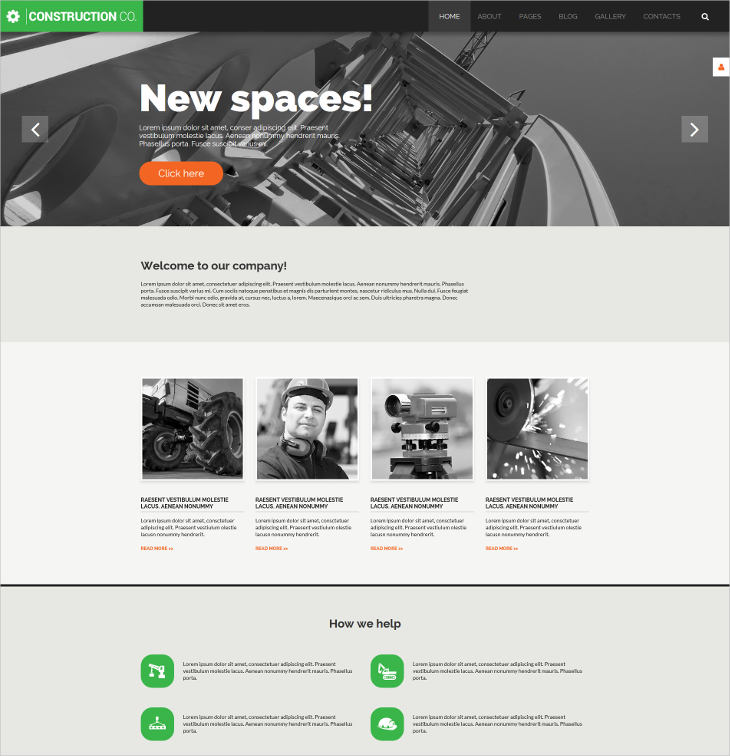 The construction theme for engineering sites comes with a box version, and with a revolution slider. There are many color options, a nice design, smooth CSS animation, and a guide for quick installation and operation. 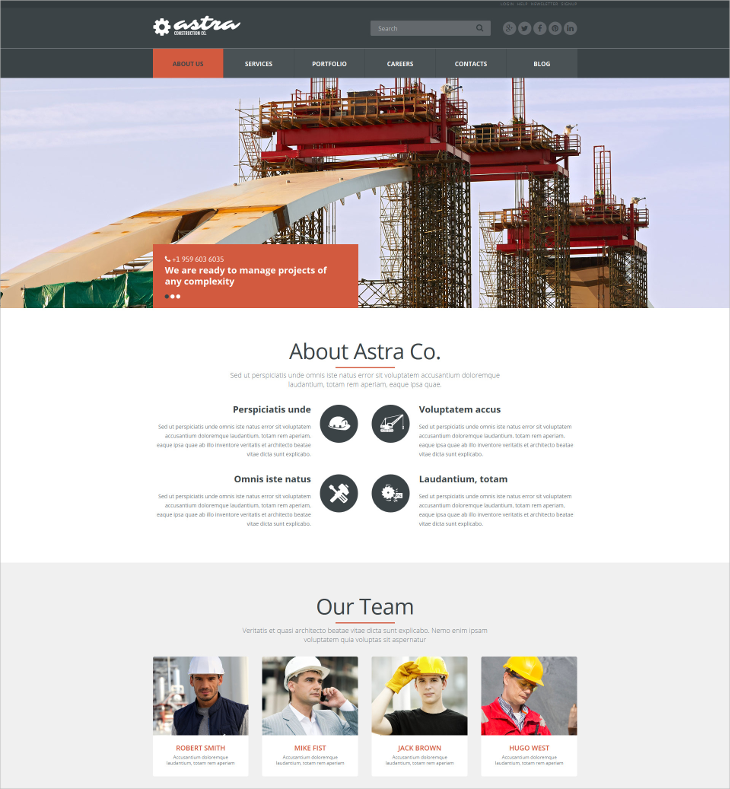 An easy to use theme in the most professional looking package which also looks great, and has a responsive design. You see a sticky header menu, a big full page width revolution slider, and a text area below that contain several icons. 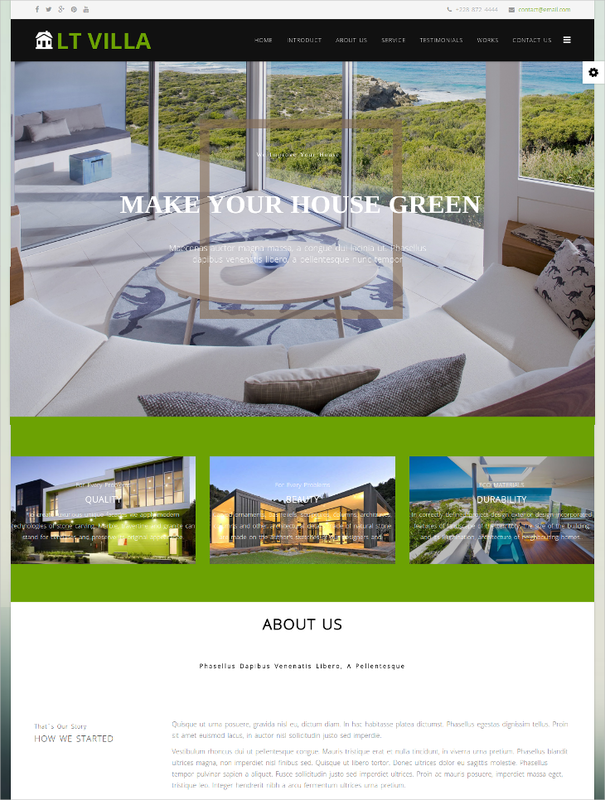 This is the neat and clean professional site design. The HTML5 and CSS3 support makes it really easy to use and customize. You also get a hot slicebox, swipe carousel, hot maps, and hot responsive lightbox module. 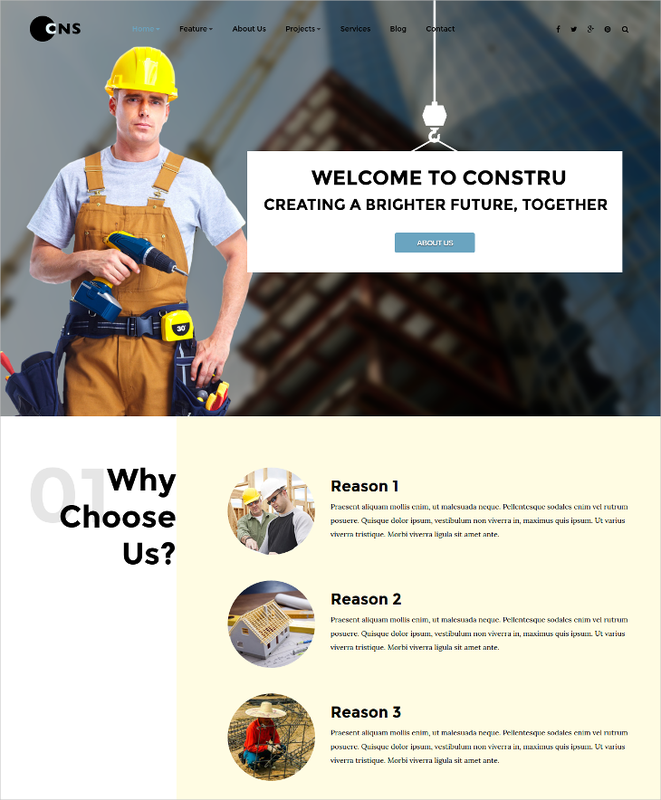 This is completely an engineering company related theme, that would bring out the best projects, accomplishment, etc of the company in the front foot with the awesome site design. The front page full-width image, and the smart text areas beneath with the sticky header menu, all makes for an excellent view. Besides the parallax effect, and the responsiveness is an added advantage. 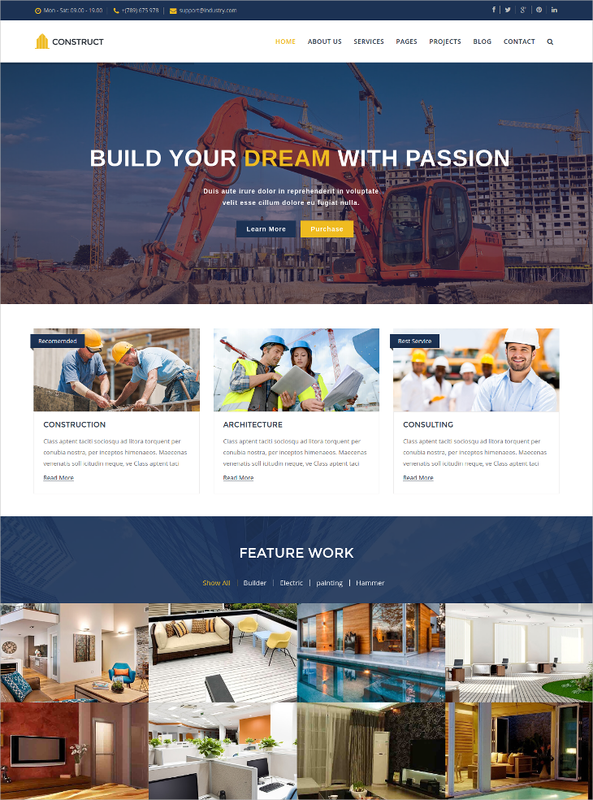 You can enjoy any of these Joomla real estate themes & templates as all are dedicated to the making of a nice engineering, construction, architecture, interior designing, or real estate based website. These Virtuemart Joomla themes and templates have all suitable features to give you the best web designing experience.